June, finally! Can we have some sunshine? Please? Happy June to you! Was I first? I have this thing I'm fighting. It's called complacency! I have no confidence right now that I'll catch fish, so I really don't have that drive to go. But, I'm going to make myself believe! I'm going to visualize me catching fish after fish! And in order to do that, I have to go fishing! I could so easily NOT go, this morning! But, I can't give up, folks! I gotta go! So, out to the bay it is. I'm joining these folks! The link, thanks to Lysters. Click the little web cam timer goody, wait the required 2 minutes, and then set it for the bar. Click on the little icon with the sun on it, and it will lighten the pic. It's 8:18 right now. Should be there by 10. We are in the Alumaweld Super Vee with the 175 jet on it. You know... the boat with the girl in it, fighting the big springer! It will be like this, again! Changed our minds after company came, and decided it was too late to fish for Springers. Tomorrow, for that. Today, we did a shake down in the new duck boat! Fished for cutts for a while and even caught a few! Odd, for this early! Thanks to Bill Monroe for this new duck boat. We really like it! The motor is a bit much for trolling, but now Bill gets to stay closer to home for duck hunting. He'll just hunt the bay, I guess. Yuck. Can't stand the taste of ocean ducks, tho! Fishy! But at least no 600 fees plus gas to go hunt in North Plains. I always teased him when he had a bad season. One year he only got one. I teased him at dinner about the 600 dollar duck! 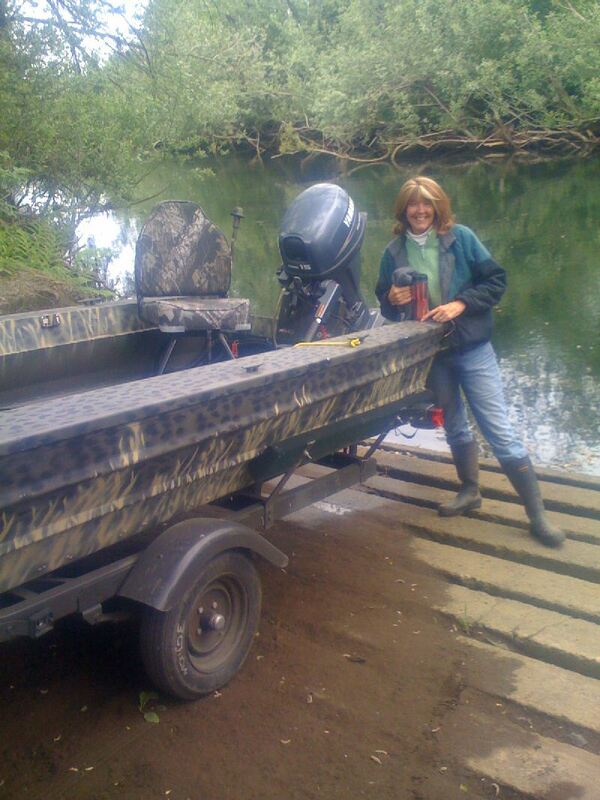 I think this boat will be just grand for bobber fishing for chinook this Fall! It has a great dance floor for playing those big ones! To heck with the ducks, Bill! This may just be my new boat! 16 foot and perfect for me! I can even do the whole trailering job on this little one! Oh! And here is why we really went! 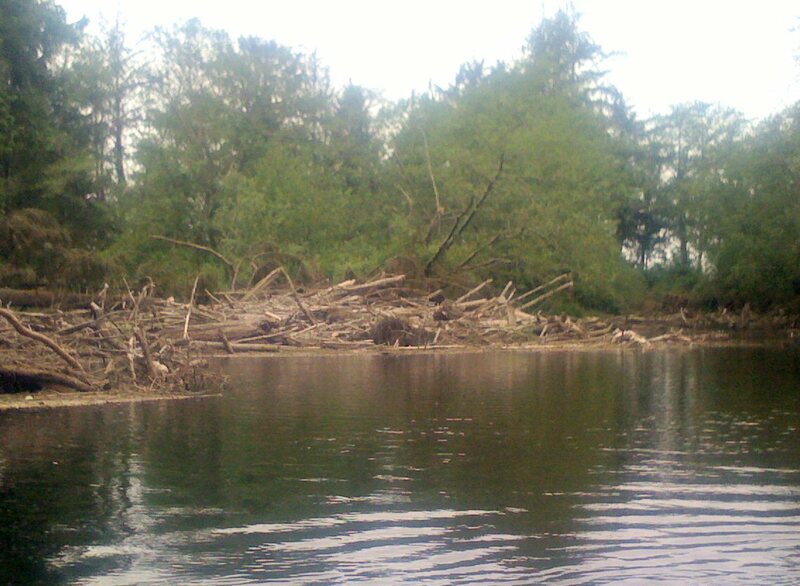 We wanted to see the log jam at the fork! Please feel free to click to zoom. It's really bad, this year. Anyhow, it was a lovely day. I love staring into the water to see what I can see. It's more fun than fishing, sometimes. So, I can't help myself. I buy flowers. I can't pass them up. I'm an addict. Yesterday, a tray (a full tray!) of lovely pink and white impatiens came home with me. I don't know how. It was an accident. Well, of course I need more planters, now, and more potting soil. The vegetable garden, meanwhile, goes unplowed and un- 'round-up'ed. Bill does chemicals. I'm afraid of them. Why grow a garden if it's going to be polluted, just like the store stuff? Makes no sense to me. I'd rather buy organic then grow polluted veggies! I can't wait for berries, though! I have so many! And real asparagai! We don't grow asparagus... because only one comes up each year! It's the annual asparagai! But the berries! Wow! They are all over! Blueberries! Strawberries! Raspberries! And so far, no deer can get to them! Whoo hooo! The fence still holds! I get alot done, procrastinating. In fact, it's the way I accomplish things. Not, of course, the things I need or set out to accomplish, but things get done, nonetheless. Like the flowers in the back of my truck. I didn't want to set them out, because I didn't want to explain them to anyone. Thus, they are hidden. My stash of flowers. No one will see them there! Right? And by the time I plant them, I'll just say, "Oh look! Volunteers from last year! Already blooming! Well, who'd a thunk?" Same way this website gets bigger. I set out to do one thing and before you know it, I have a whole new page of fishing pictures up. Who cares if I was supposed to work on billing or coding or whatever. I do this website because I'm a fish addict! This morning, I'm supposed to go clamming. I don't really want to, though, so I bet I end up fishing. Muhahahaha! Finally! It's springer for dinner! Bill and I went out yesterday. It was so windy, but we held strong against the wind. I said a prayer on the way, and it worked! Try it! God is good! What's that he said? I will make you fisher of women? Whooo hooooo! Look at Mrs. Spotty! Over 25 pounds, for sure! It was so fun! I honestly haven't been this thrilled in ages! Bill caught a little jack, first and I was so thrilled that I couldn't get over it! Over a jack! It had just been so long! It bit funny. It took a grab and Bill was just besides himself. "Was that a bite?" Yes! And here he is again! And... GOT 'EM! This picture has not been photoshopped! 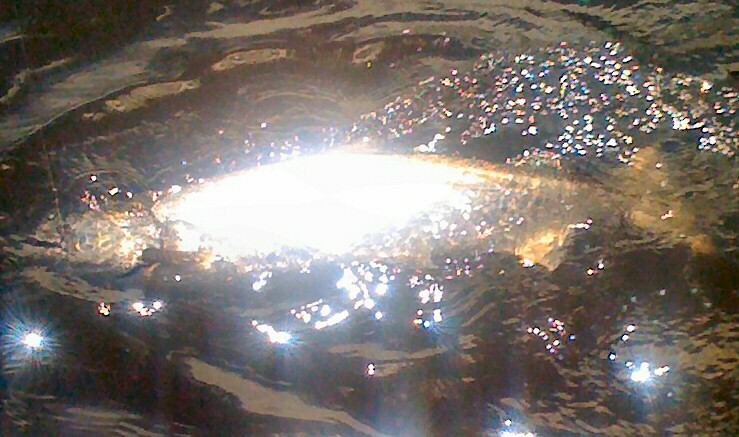 That's really how shiny it was! It would have been a great keeper, but it was wild! We were going to take our goods and go home, but I just felt fishy! My lipstick was perfect which is always a good sign! If you get a chance, try Smashbox "Invite Only". It invites only the biggest salmon! And that is what happened, next! I was fishing with green label herring. I had tied it up myself with the most awesome deadly roll I've ever seen. I'll have to share that rig with you, sometime. Bill taught it to me. He was fishing plug cut but I don't do that very well, so when he was too busy to help me, I tied it on! Man, did I! 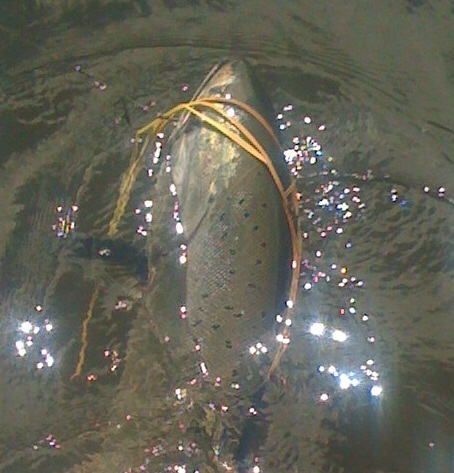 In the same stretch of water, (and I was holding the rod!) the fish almost took me to sea! I mean it grabbed that bait and wasn't givin' it back! It was one of those screamers like my 37 pounder. It raced across the top water and almost spooled me. I was so bossy! "Bill! We have to chase it! Go! Go!" Today I have to take an extra beta blocker because I want to live to do this again and again! 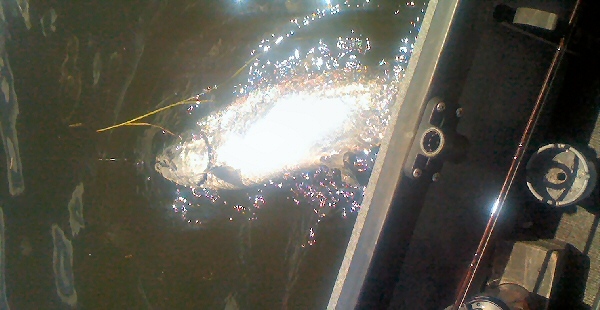 Yesterday, fighting that fish, I honestly DID overdo it! But, I turned to Bill and said, "Bill, if I die... it was worth it!" And it SO was worth it! Life is good again, when you catch fish. Honest to God. Nothing in the world tickles me more than springers! 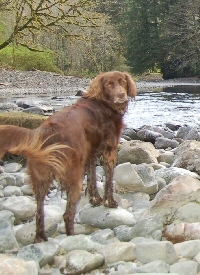 I'll bet that the last of the springer run flushed up with the raising waters, due to all this stinkin' rain! Can you even believe this weather? So many people (including myself) are complaining about it. But, on the drive home yesterday from Portland, it was just incredibly lush and beautiful. This, my dear friends, is why we shouldn't complain about the rain! It truly is beautiful! I was trying to imagine our coastal passes without what the rain does to them. I was thinking back to going over the grapevine before you hit Los Angeles. I don't want that. Do you? Sure, this is a bit excessive, but we will find the sun, soon! I promise! And it WON'T look all dry and ugly! When it does sunshine, what a party we'll have! And we'll have it in one of the most green, lush places in the world! Last night I took a walk out to the river after I arrived home from Portland and the river is muddy, raging and full like the months of winter! Finding a cutthroat in there would be like casting for a needle in a haystack! But the rain unearthed several new and shiny crystal agates. A girl's dream come true! Diamonds! Right there in my back yard! At least the kind of diamonds I love! No matter what, I'm glad I live where I do! I worry so much about Andrew's heart surgery and he's right here as a constant reminder of what is to come. I don't think it's good for either of us. I think my going to Portland is me trying to run away from reality. Whatever the case, it works for a little while! Oh! The reason I went to Portland, besides shopping for a new computer, was to see my nephews art opening at the old White Stag building. If you get a chance, go see it! His name is Joel Mertz and he is so talented! His project was so awesome! Joel's opening show will be there for a month. It's the 2007-08 Digital Arts BFA Show at The White Stag Building 4th Floor, Portland OR. Exclusive Pre-Opening is June 4th, (I went to that!). Official Opening June 5th, 2008 6-9pm. If you go, say hi to Joel for me and tell him where you heard it! I told him I'd print this. I am so impressed with him. Of course I would be... the proud Aunt Jennie! AndyK from the fly fishing board came over the other day and fished for a while. He said the temp of the water is too cool for much cutt fishing. They just aren't on the bite. It was good to have an expert fly fisher come over and tell me that. So, it isn't just me! Thank goodness! What a great guy, AndyK is. I had to leave for Portland, but Bill enjoyed conversing with him and told me all about it. 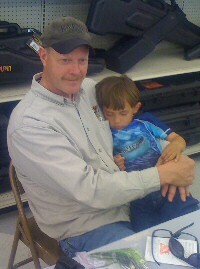 I got to visit with him before he fished, and Bill, after. When I opened the door this morning, it finally felt like spring/summer. You can just feel it in the weight of the air. Despite the cool breeze, the deluge of water, and the fact that the sounds of the river are in philharmonic orchestra, it still is undeniably summer. We have so many grosbeak right now. The air is just full of them and they are so colorful and tropical looking! We have to fill about 15 feeders, daily. They sure keep us busy! Even though I long for the sunshine, I feel like I just have to appreciate each day, no matter what it brings! Join me? 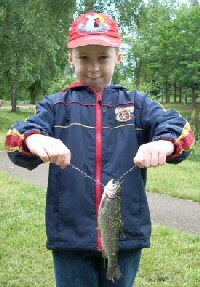 Ifish members get out there and help the kids catch fish on free fishing day! Read all about it, here! I wish you could see it! I woke this morning after a long, summer's nap, (but very much like winter!). I padded down the carpeted stairs with stocking feet, grabbed a hot cup of coffee and opened the door for the dogs. The wood floors of my kitchen are freshly mopped and I slid across the last couple feet, cleanly. Nothing sticky to stop me. Life is good when your floors are clean! Cool, misty air hit me full in the face, as I stood with steaming coffee in hand. This was the kind of air that you wish for in August. Weather that would be a pleasure after a hot spell. Somehow, still, it was nice after being cradled softly with fresh sheets and down blankets all night. Nice, soft, quiet. I love mornings so much! Life is good when you have clean sheets. I've always been a morning person, too. Treetops reached high into the clouds and disappeared into the heavy fog. The sky was one solid blanket of white, dripping sweet, clean moisture down on everything, like frosting on a cake. One noisy grosbeak serenaded me from a nearby pear tree. I couldn't help but lean against the door jam, breathe deeply and take it all in. We have one pear tree that is just now turning this beautiful shade of red. It's the only one that bloomed at all, this year. I wonder if asian pears are on are late summer menu? I hope so! Just one year did we have fruit from our trees. It's the luck of the draw, around here, weather wise and pollination wise. Even though we bought mason bees, they can only do so much, if the winds and rains of late spring blow the whole works away! Or like this year, when a late snow killed everything. I have memories of strawberry picking hovering in my mind, lately. Today I thought of the joy of having it cancelled, due to rain. We used to stand in the rows and do rain dances, hoping against hope! And oh, that wonderful feeling of the rare day of being sent home, wet and cold, to take a hot shower! The rush of excitement when the buses came early! Strawberry picking is closed! Home! Home! Home, to change into warm sweat pants, to turn up the heat and listen to your AM radio, while watching the rain fall outside your window. Oh! And to top everything off, the bonus of being able to eat your Hostess fruit pie out of your sack lunch, anyhow! And in the warmth of your own bedroom, instead of in the cold, muddy row of the strawberry fields! Today is good. Today is lazy. I'm caught up on things and I'm able to enjoy the world around me. My house is clean. My checkbook is balanced. I'm sure I could find something I "have" to do, if I tried, but I'm blessed with some kind of satisfaction, today and I'm not going to ruin it! I love it when I feel this lazy-slowness in a day. I wish I could afford the luxury of feeling this more often. Frustrating, because it's in my control. I can choose to feel this, any time I like. Instead, I worry. I pace. I ruin what is mine, by choice! So much to do! So many places to go! And what would people do if I chose not to worry about them? It makes me giggle, the way we choose to make things difficult and chaotic. Like everything else, I suppose, we have to have a little of everything, in order to appreciate it all. It's the old ying and yang of life. If you don't know chaos, you won't appreciate a day like today. I think I'll go get a Hostess fruit pie. I haven't had one in ages! I'm going to put on my sweat pants, turn up the heat and go eat it while sitting on my bed. Think I'll call an old friend from highschool, too. Today is a solidly good day. TOP TEN TIPS FROM BOATU.S. HOW TO GET THE MOST FROM A TANK OF GAS! Mark is awesome to fish with. I'm going to do that again this summer. I can't wait! We are having a party! Can you attend? It's August 2nd at Haag Lake. We need to know if you can join us! Please click here and fill out the poll. If you aren't a registered member, it would be great if you registered (finally!!!) but if you don't want to, just use the contact form to let us know if you'll attend! Please come! It will be great to meet you! Last night I couldn't sleep at all, so I lay in bed reading until Andrew got home from wherever he was! It was one in the morning, but I snuck out of bed and spooked him! We had a late night snack party like days of old. We got out the ice cream, the crackers, blue cheese, Dubliner cheese... We giggled and ate and talked till I don't know how late! I am so tired! If you put a slice of blue cheese from the Heron, here in Tillamook, and Dubliner from Costco, oh! is it ever good! Naughty us! I think I gained 10 pounds, but I bet I lost it, giggling. It's supposed to be the long end of Junuary, today. The sun is supposed to finally hit us! Do you think? Dare I hope? People in Tillamook are honestly getting depressed with the weather. Usually we say so, but everyone is still in relatively good spirits. This time? It's scary! People are grouchy! But, the party we'll have when the sun comes out! I wonder if we'll recognize what that big yellow thing in the sky is? Is it just me getting old, or is life kind of scary, these days? I know that I used to laugh at my parents and grandparents for being so cynical about life when they got older. The old, "the end is coming" theory that they'd preach really made me shake my head. But honest to God, isn't it scary? Gas? Five dollars a gallon? Come on! The weather is scary, also! Record cold in Tillamook for June and floods in Wisconsin and tornadoes of plenty and stronger than normal. I don't know. It kind of scares me! But, then again, life is scary at home, too. Although I can see that I've done my best in pushing Andrew away so that it doesn't hurt and frighten me so much, I still can't help but be absolutely petrified about his heart surgery. I have pushed him away, too! And I bet that's why! Because I'm scared stiff! I want him to move out of the house, but when I think about it, why? He should be living at home, so that I can care for him. I really don't want him to go, when I'm honest with myself. I'm feeling wishy-washy, today. Can you tell? I really enjoyed being with Andrew, last night. It made me really happy to have that midnight tea time. I think it just hit me, too, why when I was so ill, that both of the boys kind of pushed me away, too. They didn't come visit me much, and that's about the time they both began to be home, less and less. I bet they were afraid of losing me, too! I get it, now! I get it! But! We shouldn't do that! Now is the time to draw nearer to each other. I'm just not going to let it happen any more than it has. I've read about this happening, and I'm honestly surprised that they (THEY... who is they? LOL) are right. It's kind of related, and I think I'll read it again. It sure was helpful, when Bill's Mom was dying. I'm going to hold on to those I love, no matter what. I hope that you do the same. Don't be afraid, and treasure each and every moment you have together. You never know when that time will come and midnight teas will only be a memory. It's cloudy and foggy out this morning, but I can feel that strong sunshine trying with all of its might to break through. I really can't wait! By the sounds of my topic, this morning, do you think I've gotten depressed in the weather, also? I think so, and I think also that with the sunshine, our moods will collectively lighten a bit! I'm counting on it! My dentist once told me that the hardest part of parenting is after they are 18. I laughed. Didn't believe it! I do! I do, now! I won't go into details but the latest event, on top of Andrew's upcoming heart surgery has stretched me to past what I believed were my limits! Good thing I believe that God will not give me more than I can handle. I am still counting on that, God! I was shuffling through some papers and found something I wrote when Andrew and David were babies. My children are 13 months apart, and I remember some nights when Jeff, my husband then, would come home from work to find me on the couch with two bottles, one baby under each arm, trying to feed them both. There were times when all three of us were sobbing. Luckily, usually David was laughing while Andrew and I cried. David most always laughed! He was my saving grace when all else seemed horribly wrong and chaotic! He needed almost no attention. He'd just sit there in his bouncy chair, laughing! He's still that way! There were really good times, too. This paper was one of those good times and it's so nice to remember back! I wrote the following, while sitting at the kitchen table, one night. This paper is old and tattered, with a little spilled milk on it. I remember that it was a stifling hot, summer night. I unwind at the kitchen table. Three hours have passed since you closed your little eyes and I can't wait to get David up for his bottle so he'll sleep through the night. He cries, and it's music to my ears. I hurry to his side. Oh, Andrew! Two nights ago and a week solid, before, you woke five times a night crying with teething pain and your Dad and I were exhausted and puzzled and frustrated. You are sound asleep. Shall I wake you to cuddle and feed you? I miss you at this hour! All of the demands I get weary from in the day have disappeared and in the quiet, I miss your constant sounds. I am pleasantly exhausted from one of those "not often enough" perfect days of young motherhood. I want you with me to hold and cuddle and smile as the day comes to an end for me. Kiss me goodnight, little babies. I won't wake you. and miss me, just as I miss you. Makes me cry! I miss my babies! Sometimes I want them to hurry up and have babies, so that I can do it all over again... and then send them home so all I have is these good times! Next to that paper in my "correspondence" file in my cabinet was this, that a wonderful stranger sent to me, without a return address. It helps, today, as I struggle with a parenting problem that goes so much deeper than a crying baby. "Jennie-You bring joy to so many. "When asked why God chose me for these challenges, the answer was because you are strong and will show others how to believe." Thanks-"
How lovely. How nice. And how reassuring right now, as I struggle to understand why life is so hard, sometimes, when I don't know which way to turn. I am so bejumbled, this morning that I hardly noticed that the sky is a bright and beautiful blue. Thank you, Lord. I need this sunshine! With everything that we face in our lives, a song still comes to my heart. Amazing, that no matter the size of the problem, there is peace in the world, and we have free access to it absolutely anytime we need it. The birds their carols raise. And the earth and heaven be one. Always rest in peace and listen. Really listen. The answers are there. I just put up another great column by Francis Caldwell. Read it here! It reminds me of my Grandfather's stories! OK, OK! That was one long break in writing! Life has just been busy! I'm so excited! Yesterday I got a pair of my new glasses and woo (major!) hoo! I can see the greenest greens in a zillion shades, and clouds in the sky totally defined and beautiful! I just got one pair, my sun glasses. My other glasses aren't in yet. I had to get two, because marfan eyes are really sensitive to light and those changing ones don't change to dark when driving. So, these are for fishing and for driving when it's sunny. But, for me? I don't want to take them off! It's so fun to see! It makes my life exciting! On Sunday, I drove to see my Dad and family at Metzler Park in Estacada. First was golf at Springwater Golf Course. What a pretty little course that is! I didn't golf, but I drove in there to take a peek and say hi. Then, we went to Metzler park for a picnic. Oh, the food! We had a great time! It was so nice to see everyone. Funny, though, I relied on my Tom-Tom GPS to get there. What a disaster I was on Sunday! Everything I did was wrong! First, I forgot a cooler and ice, because I was in charge of a salad and pop and water. OOPS. So, I drove to a store, bought 2 of those cheapo coolers, and then off to Costco to get the pop and water. I had saved two "favorites" in my GPS. Once, I had to go securely drop off some computers at E Tech at The Hillsboro recycling center, and Costco. They are miles apart. I accidentally named them backwards. So, my GPS, instead of taking me to Costco, began taking me to the recycle center. I was 20 miles off, before I noticed! Doh! So, I reset it, and "she" (the voice within the GPS) took me back to Costco. Then, for some reason, my GPS didn't know about Metzler Park. So, I got the address off of my iphone and plugged it in. It was wrong! It took me to Clackamas, and from there, I was on my own! I finally decided to plug in the address for Springwater and it got me close enough and from there, I walked in the old fashioned way and just plain asked for help! A three hour trip ended up taking me 5! Yikes! Anyhow... it's back to the fishing world, now, and back to ifish. Also, back to my freesia! One if blooming! Finally! My garden is finally tilled and today I need to declump it! There are tons of weeds that need to be sifted out. It will be nice to sit in the dirt. I love, nice clean dirt! (Is that an oxymoron or what?) What an interesting word oxymoron is. I just looked it up .Interesting! It's borrowed from Greek, and it's "oxy" which is sharp and "mora" which is dull! Alright, back to work... and that's and oxymoron, too. Work on ifish is play. Or, at least it started out to be. Now, I've got a couple hours here and there of actual work, but because I love it, it's still play! I'll leave you with that wish, today. I wish that all of your work is play to you! It can be! Just enjoy it! I'm going to spend today catching up and perhaps tomorrow, I'll be ready to fish. Fishing for Springers... Now, that's work! I'm going out to 'see' things for a bit! Still dressed in my robe, (no one is around!) I'll go out to the river in my slippers. It's so pretty, this time of morning in the summer! My garden, the river-- Oh! I went for a canoe ride last night, and I saw things on the bottom of the river for the first time, this spring! It was so cool! Discovery channel, right in my back yard! Maybe I'll do that again, too! Don't forget my glasses! I just love them! Did I say that? After that, it's back to ifish-play! Waking in the morning with your neck in a bind can really ruin your Spring fly fishing season. Trust me! I know! This kind of pain rang a memory so dear with me that I took to heart what I read earlier this month. The book had been collecting dust on my coffee table all winter and I got around to reading it just in time! I am so glad I did! I've been fly fishing for weeks, already and I can still turn my head both ways! Now that's progress! Last year, I came to the sad reality that everything I love, hurts! This year thanks to the book, below, that doesn't have to be! Fly fishing is so much more enjoyable, if you aren't in pain! And it's well worth the price! 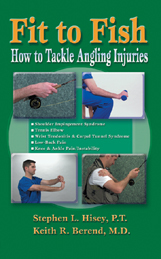 I haven't been to the doctor for my annual fly fishing pain, once! I googled and stumbled across this review of "Fit to Fish", over at flyanglersonline.com. Prevention is key, at least for me. The author of the review, Larry Compton, agrees. Mr Compton talks about how well we take care of our fishing equipment, yet we avoid care for our bodies. How true! This year, I have taken it much slower. Usually I get so excited about fly fishing opening that I really overdo it. This year, partially because of the fear of pain, and partially because of water conditions, I haven't overdone it. But, when I do fish, I take time to stretch out, before I make that first cast. Standing back from the water, I do stretching exercises, taking in the beauty of my surrounding and really breathing. Those muscles need oxygen! 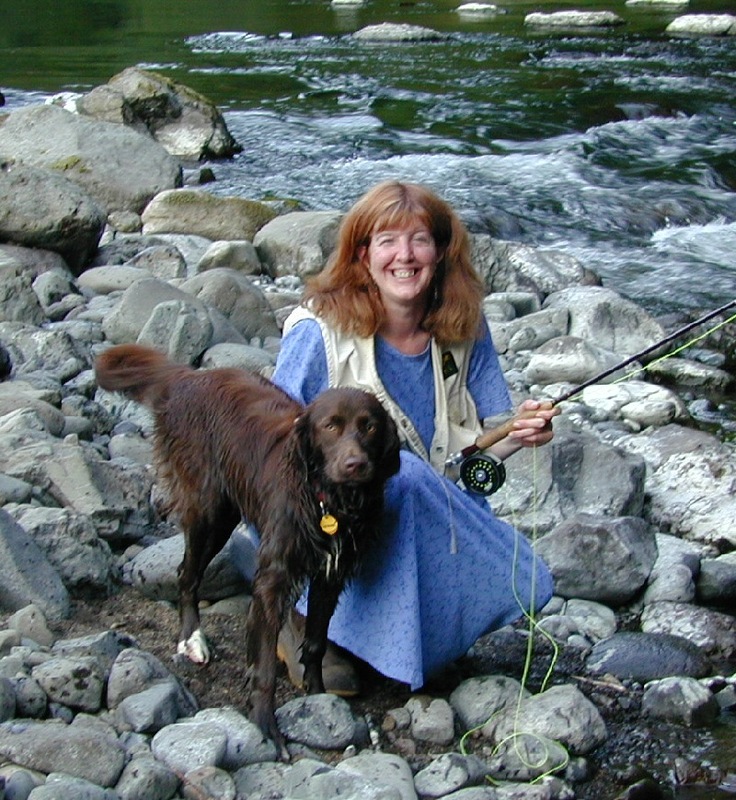 Once to the water's edge, like many fly fishers, I have this urge to try to cast really far. It's some kind of automatic 'checking of my abilities', some kind of self competition that causes me to try to cast clear across the river! There is nothing like a beautiful, long cast that lands perfectly straight and soft! Not needed! Not at all! It makes me laugh, too, because as I stare down at my feet, I realize that a fish wouldn't be laying there, just the same as it wouldn't lay across the river, in those depths. In my experience, I catch more fish, the less I cast. And- the less I cast, the longer I last! The longer I last, the more fish I catch! If I hold my offering in the current longer, I get more takes than when I constantly mend and cast. My fly is in the water longer! That's where the fish are! Doh! The Kilchis is falling into shape for some good fly fishing. I'm off to give it a shot. I'm going to take good care of the most essential fishing equipment that I have. Myself! Today I'm out in the garden, weeding. Bill and I made a date to just do it. However, I woke up with massive ifish stuff to do and he's waiting calmly in his chair... tapping his fingers. Yikes! It's like when we go fishing and he revs the motor in the truck while I'm filling my coffee, or putting pliers in my pocket! That same "yikes" feeling! I can't wait till this weekend. Come on down to Fisherman's Oregon City! I'll be there with John Childs putting on a tuna seminar. Me? Tuna? What do I know? Nothing! But, that's why I'm going! I'm bringing all of the ifish and salty dog bling! Hats, decals, shirts, and... I can't wait! Karyn at Scappoose Outfitters is making me the most special Salty Dog shirt! It's going to have sparklies all over it! If it's a hit, I wonder if she'll make them for all the salty dog girls? I hope! I can't WAIT to see it!!! 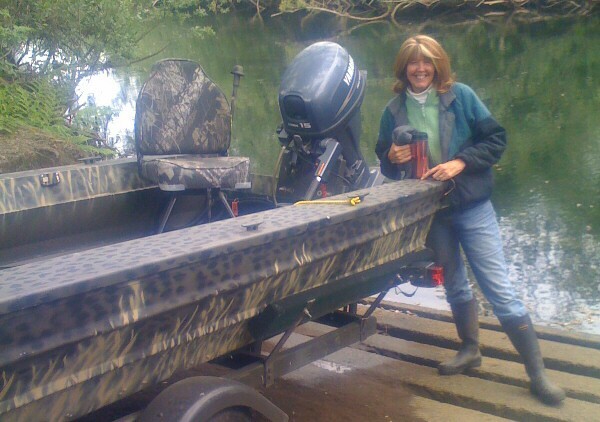 By the way, whatever you want in ifish gear to identify you on the water to all of your buddies, Karyn can make it! She is so talented! All of her stuff is so beautiful! I love my salty dog sweatshirt and so does Bill! It's made of great, really thick material and Karyn just makes classy stuff! Buy one and you'll be the hit on the water! Believe me! I get more awesome compliments on the things she makes! Read what folks have to say about wearing them! On a very sad note, I lost a very good friend of mine. Not only that, but I didn't find out until yesterday evening, a full month after it happened. Not that it matters, but it was just so sad for me. His name was Richard Mikuls. He was a very talented musician and also had marfan syndrome. I wrote about him, here. Well, no bites on the river, yesterday. I am beginning to become worried about the cutthroat run. To think that they want to open a keep fishery on these, lately, scares me. From what I can tell, the fishery cannot sustain such a thing. Have fun out there, and enjoy the sunshine! 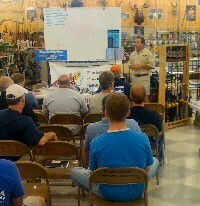 The tuna seminar at Fisherman's was lots of fun! I always enjoy talking to ifishers and other fishers, too! STGRule and Don Becker showed up to visit with me, just at the same time my Dad showed up! We had a great time telling fishing stories. My Dad had some doozies! It was so fun to share my Dad with people I care about! I'm proud of my Daddy! He was always known as "Dad" in our family. Funny. I'd never, in all of my childhood referred to him as "Daddy" until now that I'm fully grown. It's a term of affection that has "grown" on me, I guess! I do love him so much! Myrtle Bee melted my heart with this image, and I just had to take a picture of John holding his son!What a sweet thing a small child is! He also has the wonderful place in Cabo that I'm going to with the boys, this Fall! All of the ifish salty dogs are taking turns staying there for some awesome fishing! Below is John Childs, giving his tuna catching classes! He did really well! He's sure an expert in the sport! All eyes were glued to the tuna man! I had a great time, all in all, from the beginning to the end! I started off meeting Karyn from Scappoose Outfitters at Costco. I had to (got to!) go pick up my regular glasses. They fit great and the world is a beautiful place when I wear my new glasses! Whoo hoooo! I'm so thankful to Dr. Mathers for the surgery he has done for me. I pray daily that the transplant holds and that it doesn't reject. I have to take drops for longer than usual, just because there is a chance! I'm so afraid of that! I've been so spoiled, the last months, and if I lost this vision, I would be devastated! There is a lesson, here. Do not become too attached to worldly goods, (like cornea transplants!) because if you lose them, it could be way worse than before! I'm spoiled by it!! Karyn and I met at Costco and she moved all the boxes of Salty Dog gear over to my car. Three big boxes of t shirts, hats and flags! I stayed over night downtown in Portland. I had the most wonderful dinner and I just adore my peaceful time alone! I went to Ben and Jerry's and ordered a one course meal. A huge ice cream cone! I walked over to the Park blocks, sat down and got ready to dine! It was so good! Every bite, till the very last! I had never enjoyed a meal, more! I smiled a whole lot as I watched the people pass. People of all shapes, sizes, colors and styles! I really love downtown! I get so much energy from it! Then, up to my room. The very minute I hit that bed, I'm out! I don't know what's up with this, but I'm just so tired all of the time. No Tylenol PM for this girl, anymore. I can fall asleep and sleep for 12 hours at the drop of a hat! (Don't drop that hat!) So, I woke up, still fully clothed, Some late night TV program was blaring at me. I stared at it for a while, meant to turn it off, but out I went again! -Only to wake up to another late, late night program! Finally, I turned it off, set my alarm, and rose with the birds. I got ready for the show, ate a wonderful big breakfast, (not ice cream, this time!) and headed out. 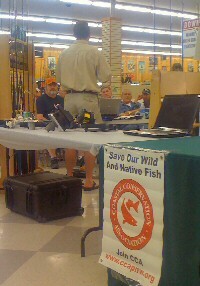 The tuna seminar was fun and educational! John Childs, like I said before, really knows the deal! 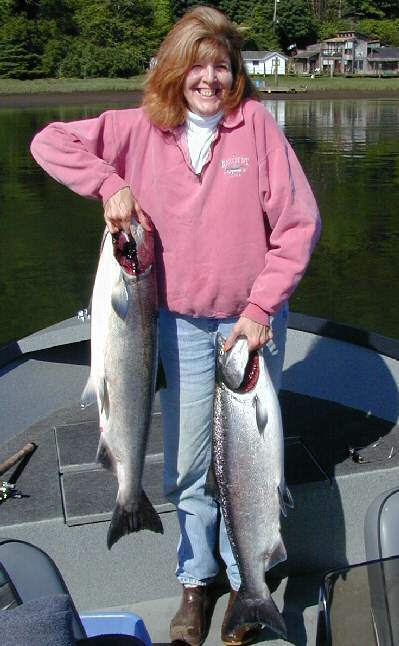 Well, I'm off to either go fish an Oregon Fishing Club lake, here in Tillamook, or I'm going to fly fish the Kilchis for a bit. Not sure which. Bill put the trolling motor on the duck boat, so that we can troll lakes at a decent speed. It's muggy and cloudy out but it's warm! First off, and before fishing, I'm going to go work in the garden! The wild labrador, Rev, was busy with his master Bill doing something, somewhere. We got the garden in, finally, and our work for the day was done. Aha! Perfect opportunity! I snuck down to the river, anxious to spend some one on one time with my dog, Kilchis. We could play without fear of getting bashed into, or run over. Hey! I'm delicate, and Rev, most certainly is not! The sun had finally dried the soil close to the river's edge. It is well into summer that you can sit on the bare grass beside the river without becoming one with the water. After some fun play digging tunnels in the sand and taking the canoe out on the windy water, (Kilchis follows me, swimming beside the canoe!) I plopped down into the long grasses and nearly disappeared! When did the grass grow so long? Kilchis couldn't find me! I couldn't help but giggle as I heard him frantically searching! The wind blew. The sights before me stifled my giggle. This feeling of awe keeps coming over me and it stifles me each time. Since I got my glasses, I'm just amazed at what I can see! I looked up just in time to catch the exposed lacy under leaves of a patch of young alder trees. I didn't know they were white, underneath! I nearly blushed! It reminded me of that famous picture of Marilyn Monroe. The scene while filming a movie, where her skirt blows in the wind. "Put your leaves down, trees! Have you no decency? lol! More than anything, though, I couldn't get over the beautiful contrast of colors surrounding me. The white of the under leaves against the dark hues of purple wildflowers and deep green grasses. The deep forest green of trees that wall up the mountainside and reach for the sky, oh my! 10 thousand colors of deep greens. Now I know the true meaning of the color crayon in the box called "forest green". Remember that one? Whoever named that crayon has seen this forest! I turned and looked towards the water. Tiny specks of tree debris made a lacy pattern on the still water. Tiny swallows dipping down to the river picking bugs! I can see that! No longer do I have to fib! When I'm working at the computer, there are several times that Bill yells to me. "Jennie! Come see this!" Almost instantly a feeling of dread would come over me. I'd get up and go to where he was and strain to see what he saw. It became easier, as I lost my vision to just fib and say that I saw it. Otherwise, I was assaulted with a battery of "It's to your left, over by the bush, CAN'T you see it? Jennie! It's plain as day! Under the tree! Four feet from the... "
"Oh, yes, Bill! Yes! I see it!" A million needles in my eye..
Oh well. It satisfied him. I wasn't really lying, anyhow. In my mind's eye, I could imagine them there. All around me must be a field of dreams. A nature film off the Discovery channel. And if I couldn't really see it, I could watch it all on television! But now? I don't need the television! I can really see it and it truly is a Discovery Channel come true! I live in paradise!! I see the rabbit and the swallow and the fawn! Even if it's way, way over there! It was good, what I saw before. I could see schools of salmon in the water. I could see a deer or an elk. I could manage to get by. They were a bit blurry, but I could see that they were there, unless they were small things like rabbits. But, now? Now I can't wait to see the salmon again! I wonder what details will be exposed in a salmon redd, now? Will I see their scales exposed, or the little purple dots on a chinook, gleaming in the sunshine through the water? Will I? So much in life to look forward to, when I keep receiving these gifts. Gifts of sight, gifts of life! I brushed my legs as I got up, making sure my skirt was down. Kilchis wagged his tail. I wagged mine. "There is my Mom!" Kilchis, "the happiness of the world" as I call him, raced towards me. I raced towards him. Well, I raced as fast as I can race, that is! "Let's play, Mom! Let's play!" I got down on my knees and braced myself as he approached me. Oh, no! He was approaching me wild, like Rev would approach me! Help! He knocked me over in the tall grasses and we tumbled and played and laughed. Life is good on the river. I am so excited to introduce to you the most awesome post on ifish, lately! Look at all the work that STGRule did to make these kids happy! Thank you to all, and especially STGrule! I wish I had a picture! Last night the wind was calm. I slid the canoe off the sand and hopped in, like I usually do. Often, Molly joins us on the river beach. For all that don't know, Molly is my fishng cat. I've never had a cat like Molly. Molly likes the river. Molly sits on my shoulder, while I fish for steelhead. Molly joins us in the driftboat. Well, Molly also joins me in the canoe! She jumps in, and then heads for the bow. She sits on that little triangle piece on the front, while I row around, looking for fish in the depths. What a weird cat! She licks her paws, and looks to the sky. She is very interested in the swallows as we duck their dive bombing for bugs, together! I just adore that cat! I'm the berry fairy around here. It's fun. They are so good! However, there are only a few of some! Therefore, they are very, very special, these berries! The strawberries are first. What the birds don't get, I get. I finally netted some and fenced in some more, so that the chickens wouldn't get them all. So, now the chickens have a patch, I have a patch, and the wild birds have a patch. Everyone should be happy. What I do-- I go out in the morning and pick a hand full of the very best berries. Then, (I eat a few, first!) I head over to the boys windows, where they usually reside that time of day, and I knock. I have previously counted the remaining berries. "Berry fairy! You get four!" They reach out and take their berries and express their pleasure to me. Then I head to the next window. "Berry fairy!" Regardless, I can't wait for raspberries! There are tons of them! I'll have to change my name to "Berry pig!" My heart breaks just a little every time I think about the fact that ifish keeps me so busy that I rarely get to spend quality time with the ifish community. There are days, sometimes, when I don't even get to look at the boards. The mod board people know me like family, though! That means that people on the community leave me comments and I don't even see them unless I do a search on ifish for my name. My eyes start to hurt after a little while of work on the ifish alerts and billing, and book keeping, and there isn't much left over in me. I miss ifish! 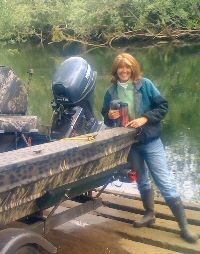 I miss seeing fish caught, and hearing veiled reports and talking to my friends! Last night, tho, I got a secret phone call from a friend who told me where they are! As soon as we are done with our porch project, we can try to get them! I can't wait! Last night I lay in bed reading a really wonderful book. When I find a good book that holds my attention, I'm lost in it. "Still Life with Chickens" by Catherine Goldhammer has done that to me. I always feel years wiser when I finish a good book. I'm filled with new analogies and thoughts that recur when I do familiar things in my life, that I associate with things I've read. One thing that will be ever lasting from this book as I make my way to the chicken coop is her thought, "Finding a warm egg felt miraculous. "Putting a warm egg into someone’s suspecting hand was like handing them the moon." I love things like that! That's so true and so perfect! Things that make me swell with joy inside! Someone wrote my un described thought! Yes! The moon! Now, I can't wait to hand someone the moon! Today, Friday, is a golden day. It's supposed to be clear and warm. You can tell, too. The morning sunlight caught my eye. An American Goldfinch eating at the feeder met my glance and it was the most brilliant 'yolk of an egg' yellow you've ever seen in the sunlight. Fall has ever so slightly touched the trees with the golden hue of their future. If you were to look out with me, you'd see green and think I was crazy. But, I can see it. It has brushed the tips with burnt sienna. The lawn, too. It's lost it's Spring newness. Yesterday, while laying in the sun, worshipping and reading, I bird-heard. Bird hearing is much different than bird watching. I could tell each bird by the flap of their wings. It was so fun! For sure you can identify the hummingbird as it's wings beat like a crazy, tiny drum as it whirs by! The grosbeak have this loud and awkward flutter to them, and you can tell when the parents are trying madly to teach their young to feed. The few remaining band tailed pigeons are awkward, high up in the trees, waiting for me to leave. They taunt me with their wing flaps and their calls give them away. "hoo! hooo! hoooooooooooooo." You can tell the difference between an American goldfinch and a purple, if you try hard enough. Purples are much more delicate and non aggressive. Well, I finally got the last of the seeds planted. I kept telling Bill not to fret. Our garden would get finished, even if the goods don't grow! It felt wonderful to get down on my hands and knees and play in the soft and finally dry dirt. Dirt is so cleansing, sometimes. After dinner, I snuck out to throw bugs for bit. There is this one place, where on the river beach you leave the frog water of the Kilchis and there is no where to go, but to enter a maple tree tent. In mid summer, you must lift the limbs which hold a heavy entry way of leaves that cascade down to the gravel. Inside, it's dark and shady and cool and wonderful on a hot, sunny day. I imagine eating lunch there, one day, hidden inside. I imagine that if it were not for the dogs, deer and bear and cougar would come to drink and I would see them, but they would not see me. Upon exiting the other side, you are met with a wonderful fishing grounds. A small rush of trickling water gurgles over rocks and falls deep into a pool, filled with my dream of the largest cutthroat trout that exist, (and even bigger!) and a few summer steelhead. Going through this tunnel of tree makes me feel like I've gone through Cinderella's Castle at Disneyland and ended up in fantasyland! I caught a cutthroat there, last night. Speckles that matched the evening sky and a gash under it's chin that reflected the sun. I kneeled by the waterside long after I let him go, worshipping the colors and its spirit. There is always that, "Did that really happen?" feeling, after catching a fish and letting him go. Cutthroat trout are mystical, magical, worthy-of-worship. They are what dreams are made of. They are a perfect ending to a perfect day. Kilchis, my dog, loves it at this end of the river. I don't know why. But, seeing his happiness over nothing at all, made my heart soar. His front feet were up on a boulder, his back feet, supporting his body. He stood like that forever, it seemed, wagging his bushy, long haired tail back and forth, surveying his land. His tail did not stop wagging, ever! I don't know what he looks at, but it makes him so happy. Why can't people be this happy? Over nothing at all? Just happy to be. I want that. Night was fast coming upon us. I called Kilchis from his place of joy and for a minute, I thought he left it there. Not to be! That tail wagged all the way home! I had to travel back through the maple castle and back to the house. If it was dark under that tree, before, it was midnight by now! I half expected to meet an owl in there, or worse yet, a bobcat! At that thought, I hurried through! It was a perfect day, and as I glance out the window, it looks as if it might repeat itself. I hope so! And now, it's out to the chicken coop, instead of the berry patch. I want to knock on the kids window and hand them a warm egg. Everyone should feel the moon in their hands! 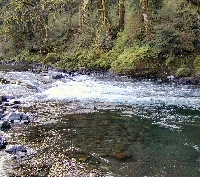 After that, I think I'll go hunt agates in the river shallows, with a pair of old tennis shoes on. That always makes for a good day. The dogs think so, too. Today is the June Dairy Parade, but... I think it's too hot to go. I think I'll buy one of those cheap float things and go float around in the river, watching for fish. It's just too hot for most anything else! My hummies are playing in the sprinklers! I have a hose set up in my bird bath because it leaks. Part of it sprinkles over the side, sometimes and the hummies are flying through it at top speed! It's hilarious!